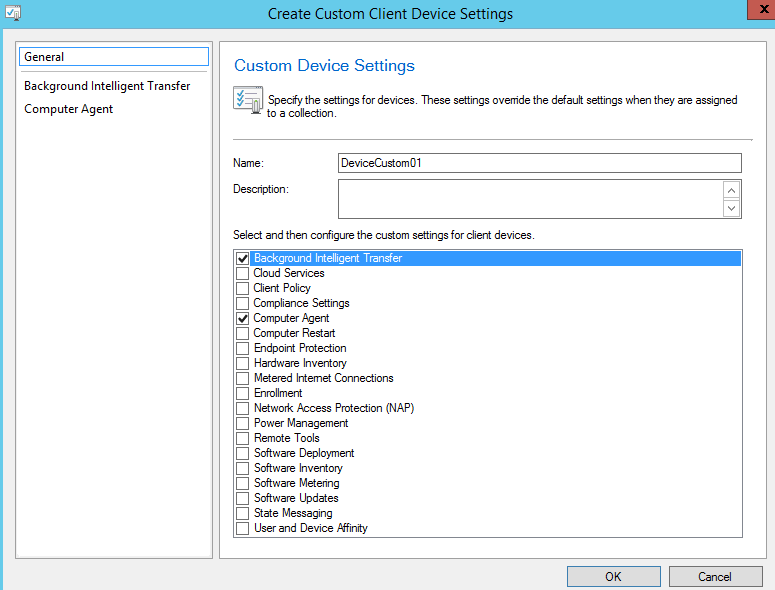 The Configuration Manager 2012 client software provides full management capability for users and devices. It is used to interact with the Configuration Manager site servers, and it consists of different agents that you can enable or disable. You use the Client Settings section of the Administration workspace to control the agent settings and configuration of the client software. It is possible to apply the same settings to all clients in the hierarchy, or you can apply different client settings to different set of users and devices, by creating custom settings and deploying these to collections. 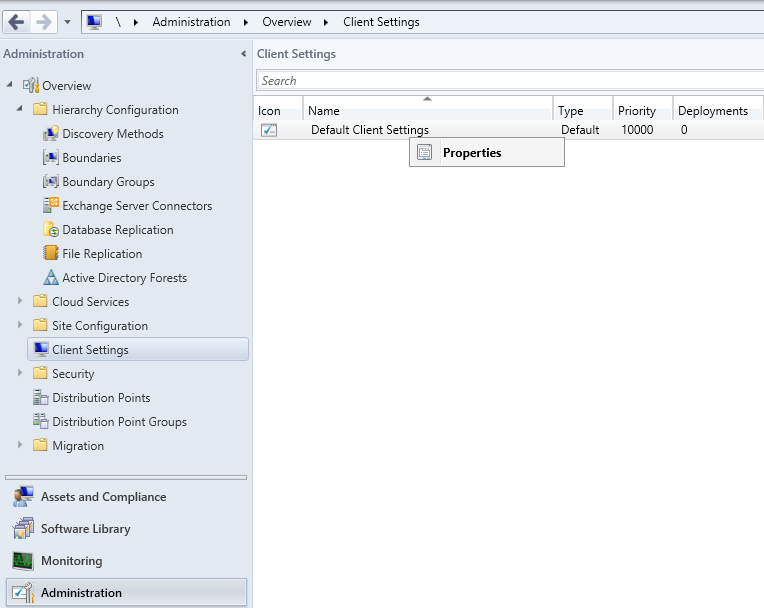 You can find the default client settings in the Client Settings node of the Administration workspace. Individual client settings will be covered in detail in blog posts related to specific settings, so I will only give a short description of each setting here. You can also read a complete description of the different settings on Microsoft Technet. 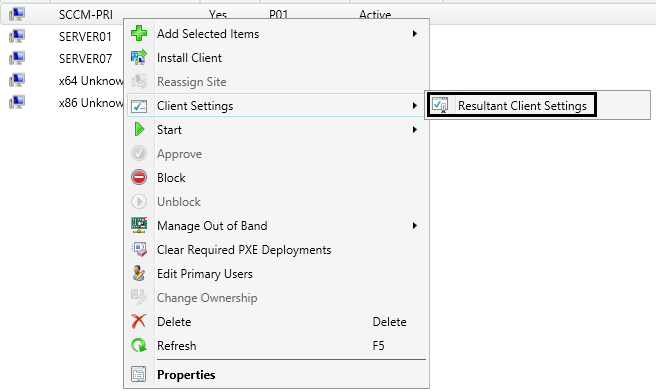 To view the list of all possible settings, right-click the Default Client Settings and then select Properties in the right-click context menu. 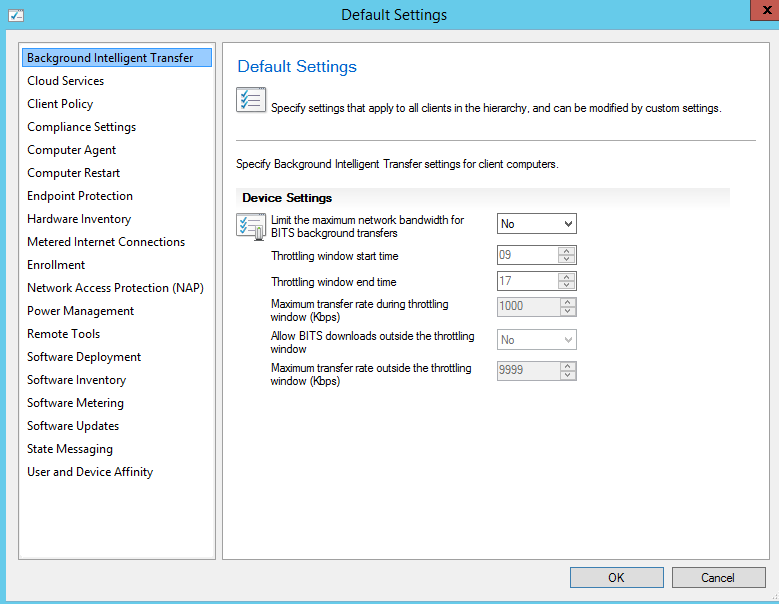 Background Intelligent Transfer – Configure settings related to BITS. BITS is used by the client when it communicates with Management Points and Distribution Points. Cloud Services – Specify if client computers can access cloud distribution points or not. Client Policy – Specify how often the client agent will contact the management point for a policy refresh. Also specify if user policy will be enabled on clients, and whether it will be enabled for only intranet clients, or both intranet and internet clients. 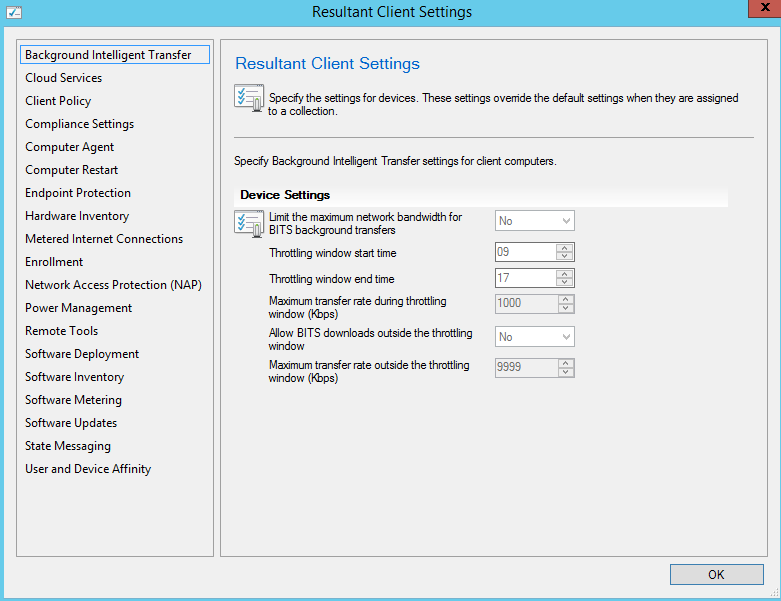 Compliance Settings – Specify how client computers retrieve compliance settings. Computer Agent – Most of the basic Configuration Manager client settings are configured here. They include when users will be reminded about future deployments, who can start any deployment on the client (All Users, Administrators, Primary Users, or No Users) and specification of default Application Catalog Website Point. Computer Restart – Configure when restart notifications are shown. Endpoint Protection – Here you can enable or disable the System Center Endpoint Protection agent. These settings are configurable only when you have installed the Endpoint Protection Site System role. 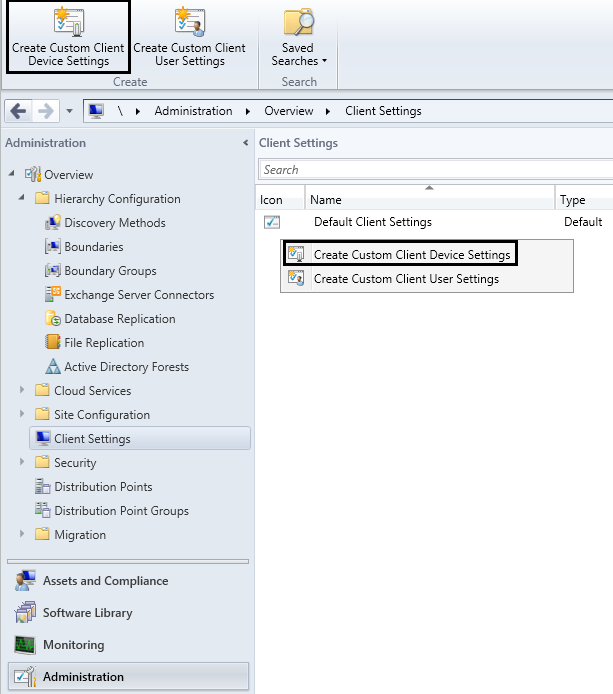 Hardware Inventory – Specify hardware inventory settings for client computers. Metered Internet Connections – Configure if you will allow, limit or block client communication if client computers are utilizing an Internet service provider that charges based on the amount of data that is used. Enrollment – Configure options related to enrollment of mobile devices and Mac computers. Network Access Protection (NAP) – Here you can enable Network Access Protection on clients, and schedule when scans will occur. Power Management – Specify power management settings for clients computers. 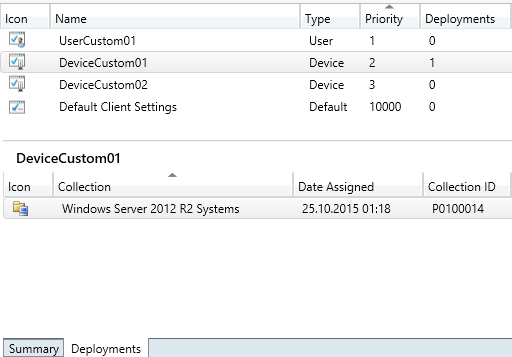 Remote Tools – Configure the Remote Tools and Remote Assistance settings for Windows clients. 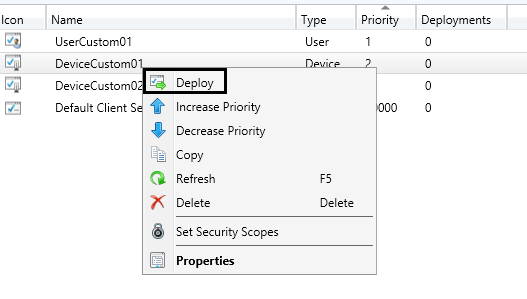 Software Deployment – Schedule how often the client should check for new deployments. Software Inventory – Configure settings related to software inventory, such as enabling or disabling it, setting a schedule for how often it should occur etc. Software Metering – Settings related to monitoring software usage on client computers. Software Updates – Here you can enable software updates, control how often clients will perform a scan for software updates, and determine whether or not all required updates should be installed when deployment deadline is reached. State Messaging – Configure how often state messages are reported from the client to the management point. User and Device Affinity – Control the calculations that are used to determine when a user is considered a primary user for a device. And if users can definer their primary devices or not. 2.4 Deploy the settings to your preferred collection. 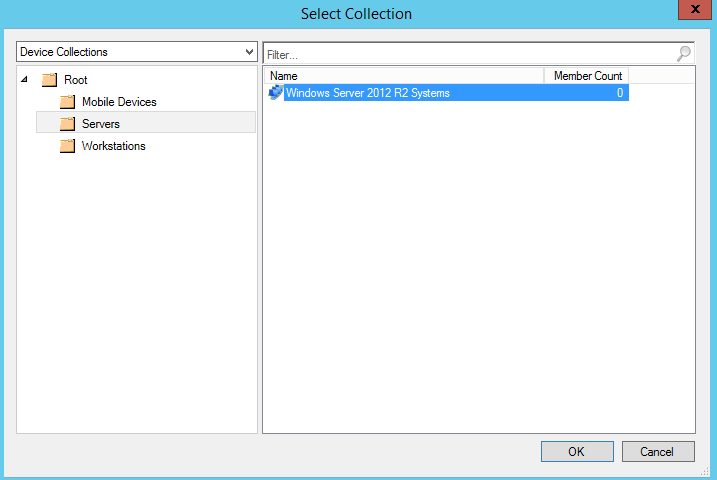 2.5 It is possible to deploy the same settings to multiple collections, and one single collection can have multiple custom settings to deployed to it. 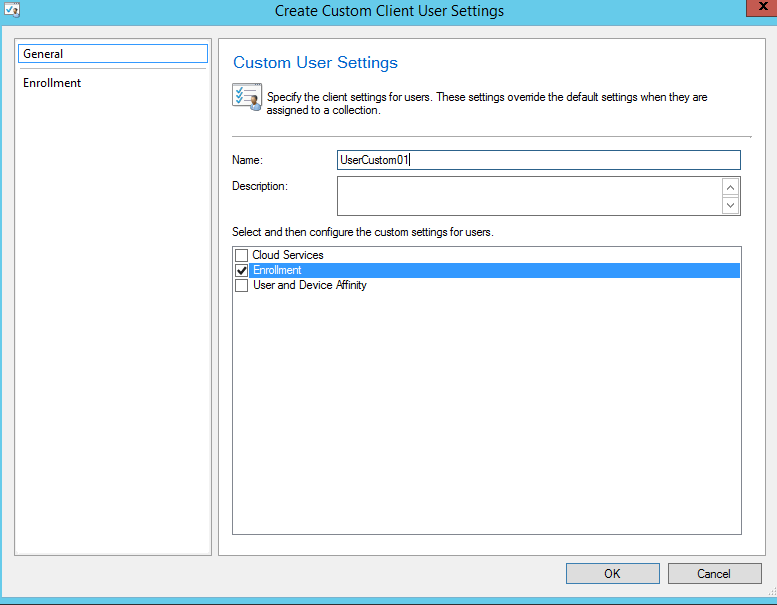 The number in the Deployments column indicates the number of collections that are affected by the custom client settings. 2.6 In the event of a conflict, the custom setting with the lowest priority number will take precedence. 2.7 You can increase or decrease priority of a custom setting, by using the ribbon bar or the right-click context menu. It is not possible to increase or decrease the priority of Default Client Settings.